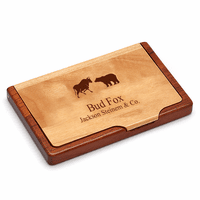 Make a lasting impression on clients and coworkers alike with this bull & bear desktop business card holder. 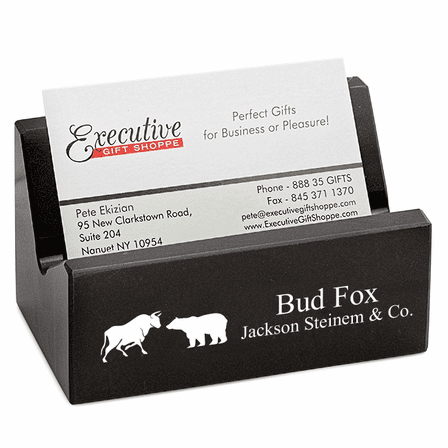 Made of solid black marble, it cradles up to twenty five business cards in its fold. 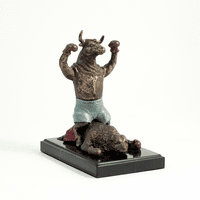 The front comes with a bull and bear emblem, the symbol of the finance industry, laser engraved right into the marble. 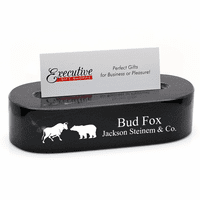 You'll add your own personalization next to this free of charge. The laser engraving reacts with the marble to produce a beautiflly contrasting white text. 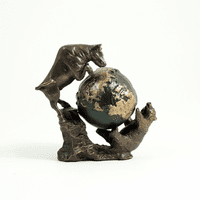 This wall street theme desktop card holder comes packaged in a gift box, ready to be presented to a hardworking stock broker or trader. Dimensions: 4" x 2 1/4" x 2"